James 2:18 But someone will say, “You have faith; I have deeds.”Show me your faith without deeds, and I will show you my faith by what I do. Anyone can make a statement, but their statement is not validated simply because they spoke. We can say we believe in God; we can say that we have faith, but if these statements are not followed by actions then they are simply statements. Words that we speak are not real simply because we have spoken them. They must be accompanied by reality, by actions. Faith and deeds go hand and hand. One can exist without the other, but it would not be a true reflection of its Biblical understanding. Lord, help my faith become known through my actions. The Bible is the inerrant Word of God, thus receiving a new Bible is, for many, a joyous occasion. As they hold it within their hands, as they understand the power that is found in each Testament, within each book, upon each page, within each God inspired Word. We could probably agree that receiving a new Bible is a BIG deal, but receiving a new Bible with amazing study aids is a HUGE blessing. 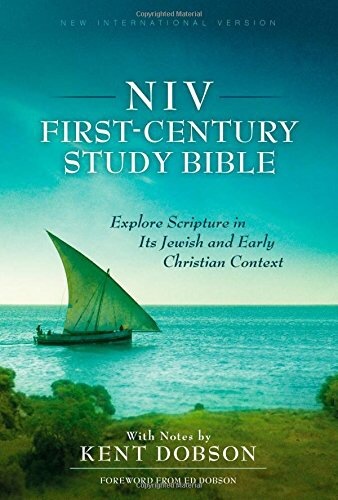 While there is power in the Word of God alone, having a Bible like the NIV First-Century Study Bible takes the study of God’s Word to a new level. This Bible is jam packed with notes and instructions that will help alter the walk of any serious Bible student. From the book introductions and outlines, through the Day in the Life and Addressing the Text Articles, followed up with powerfully focused study notes, this Bible is an amazing tool. My shelves are filled with many Bibles, but this one has quickly become one of my favorites. For those who desire a deeper time of study, this Bible is a MUST purchase. Real faith, Biblical faith, Godly faith, faith as it is described in scripture, is active. Faith without action is not faith at all. Faith without action is useless; it’s demeaning to God. How can you agree in and about something and express this openly? How can you say, “Yes, breathing is vital to our existence,” but make the decision not to breath anymore? Yes, that’s an extreme example, but isn’t inactive faith also an extreme issue? Inactive faith leads to an eternity in Hell, because inactive faith is not faith at all. Lord, help my faith come alive. James 2:14-16 What good is it, my brothers, if a man claims to have faith but has no deeds? Can such faith save him? Suppose a brother or sister is without clothes and daily food. If one of you says to him, “Go, I wish you well; keep warm and well fed,” but does nothing about his physical needs, what good is it? Deeds are not our saving grace; our saving grace is the shed blood of Jesus which was spilled to cover the sins of the world. Is it possible, however, to be saved and not serve? While deeds do not bring about salvation, they are a direct result of our salvation. If we have truly been saved from the clutches of our sins, we will have the desire to see that the same happens for others. We will do whatever we can to see that the message of the church is extended into the world. Without those who have been washed by the blood, serving in the church would be lost, the world would be lost. This world needs more people willing to stand up for what they believe by demonstrating its impact on their lives, and that’s what serving is all about; we serve because God first served us through His Son, Jesus. Lord, help me become willing to serve You not as a means of receiving salvation, but as a way to show my gratitude for all that You have done in my life. Mercy triumphs over judgment. Mercy triumphs over judgment, but what exactly does that mean? Judgment without mercy will be given to anyone who does not extend mercy to others. But as we offer mercy to others, mercy will be given in return, thus mercy triumphs over judgment. Does that sound fair? Why should the way we treat others matter? Well, it’s simple. If we are acting liking Christians, if we are living like Christians, it does matter. As Christians, we are representing God through our actions, through our words, through the presentation of our lives within this world. We have an easy choice: we can live up to the potential of God, thus treating others properly, or we can live up to our own potential or preferences and be treated in the same manner as we treat others. It’s an easy choice to make. What is your decision? Lord, help me treat others in a way that demonstrates Your presence and mercy within my life. The manner in which we live our lives is important. People need to see us acting with the understanding that we will have to give an account for our actions. People need to hear us speaking with the understanding that we will have to give an account for our words. People need to see us striving to live our lives out loud for God. This importance cannot be understated or dismissed, for it has a real impact on our eternal placement. For if we are not living purposefully for God in such a manner that people notice our love for Him, are we really living for Him? Lord, help me have the courage to make You the most important thing in my life. James 2:11 For he who said, “Do not commit adultery,” also said, “Do not murder.” If you do not commit adultery but do commit murder, you have become a lawbreaker. James moves on in this verse to offer a clear understanding of the previous. He wants his readers, he wants us, to understand that we cannot work our way out of a complete, truthful, understanding of sin and the law of God. In his example for us, James demonstrates that following one law and rejecting another makes a person guilty of sinning. In others words, as he has already stated, keeping one aspect of the law and rejecting another is a sin in the eyes of God. Why? Does it really matter? Of course it matters. How can we claim to love God but choose to follow only the regulations that do not interfere with our wishes and/or desires? Lord, help me have the strength and courage to follow all of Your decrees. This verse brings about a serious topic that needs complete understanding. In the eyes of God, we are considered guilty for one small infraction. While we might consider missing the mark on one thing not so bad, God sees it as it is, a sin. While we believe that a curve every so often in our witness is not so bad, God see it as it is, sin. So many people walk through their Christianity with the ideology that God is going to stretch His understanding of forgiveness and commitment to cover their misgivings, their missed opportunities, and their missing commitment. What we need to understand is very clearly taught throughout scripture: we must live our lives completely focused on and for the glory of God. If at any time we set Him and/or His ideology aside, we are guilty of sinning. Lord, help me live my life in a manner that strives to glorify You at all times. James 2:9 But if you show favoritism, you sin and are convicted by the law as lawbreakers. Why is favoritism wrong? The act of favoritism finds us utilizing a selection process that puts worth or value on people. While, on the surface, this does not seem to be a big deal, it is detrimental in many ways. Favoritism places people into unnecessary categories. We all understand that there are people who can perform certain tasks while others do not have the ability, but they still have worth. We all understand that there are people who can be of benefit to our lives, while there are also those who can just be present, but they still have worth. Everyone has worth. Everyone has value. Everyone is important. Favoritism is a sin because it devalues one person and values another. Favoritism is a sin because it devalues that which God believes is valuable. Lord, help me see ALL people as You see them. Is it really necessary to have a positive, loving attitude towards our neighbors? Is it important to treat our neighbors in the same manner that we ourselves would like them to treat us? While we are considering those questions, let’s consider another: If we do not treat our neighbors in a proper Godly manner, how are they going to see Jesus? People want to meet Jesus, and they will. But until they stand before	Him in judgment, they must see Him within our lives and attitudes. For if they do not, isn’t it our fault that they have not received salvation? Lord, help me live my faith purposefully and focused, so others will see Your presence within me and find You.